In many cases, partition (it has a drive letter) may become inaccessible; for example, when you open a partition, it prompts "The disk in drive * is not formatted. Do you want to format it now? ", the directory is damaged, or the partition becomes "RAW" format. Files in the partition are all invisible. Main reasons are as follows: USB flash disk is pulled out directly without clicking Safely Remove, virus attack, system halt or sudden power failure, etc. Besides, if a partition is formatted by accident, its files can not be seen or accessed. The common feature of these situations is that the partition becomes inaccessible but the partition is not lost. 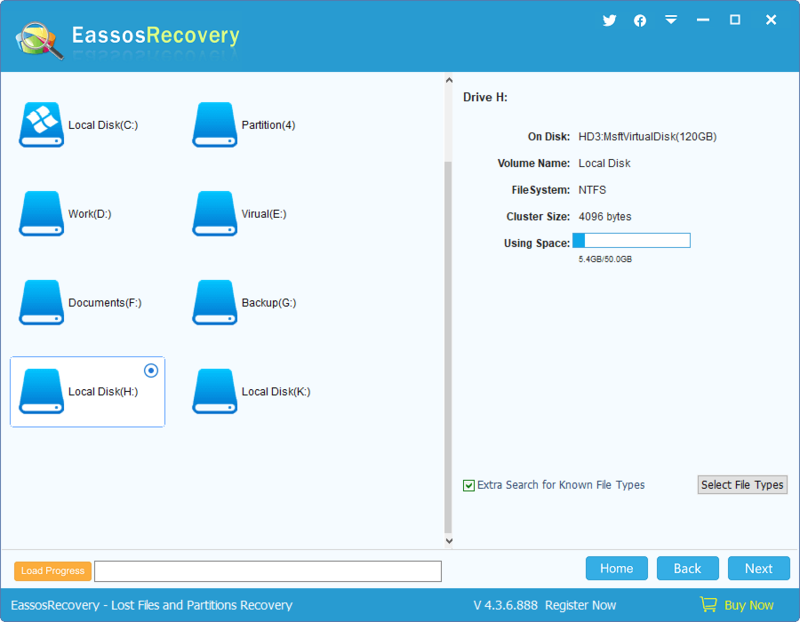 When these happen, you can use Eassos Recovery to recover files from partition. 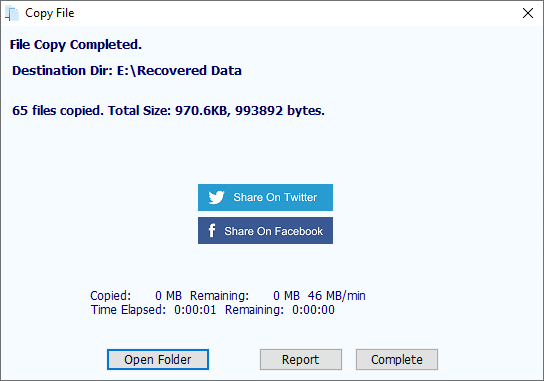 This function is divided into 3 steps: Select Partition, Select Files to Recover and Save Recovered Files. 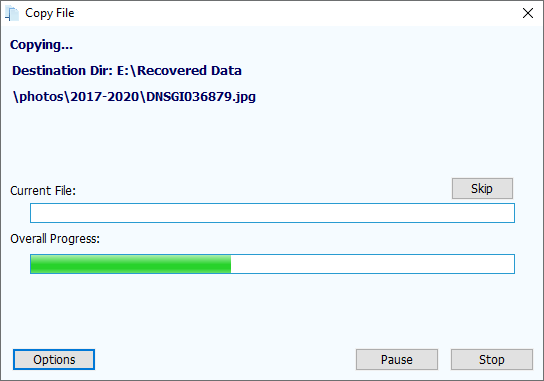 If you recovered files and saved scan progress before, you can click the button "Load Progress" to continue the scanning. Make sure the selected partition is the one you want to recover files, and then click "Next". 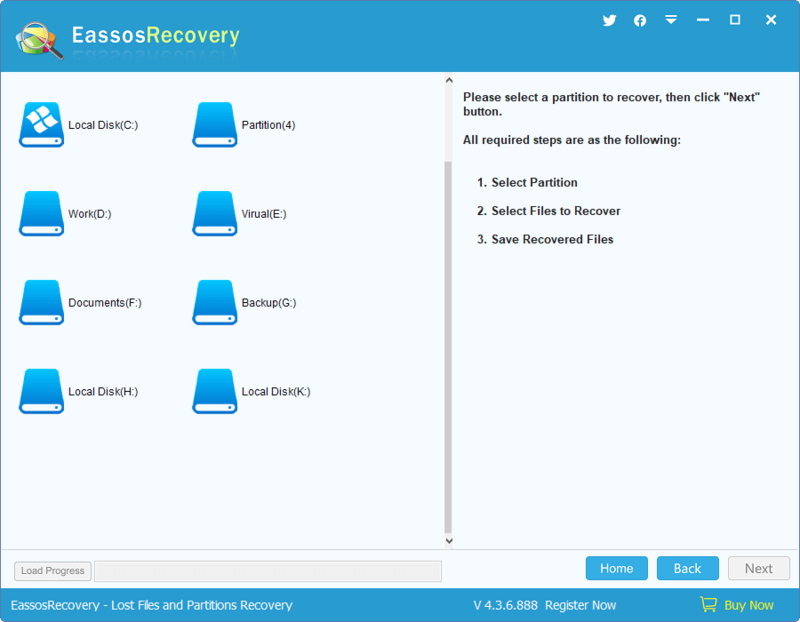 Eassos Recovery starts to scan the partition . 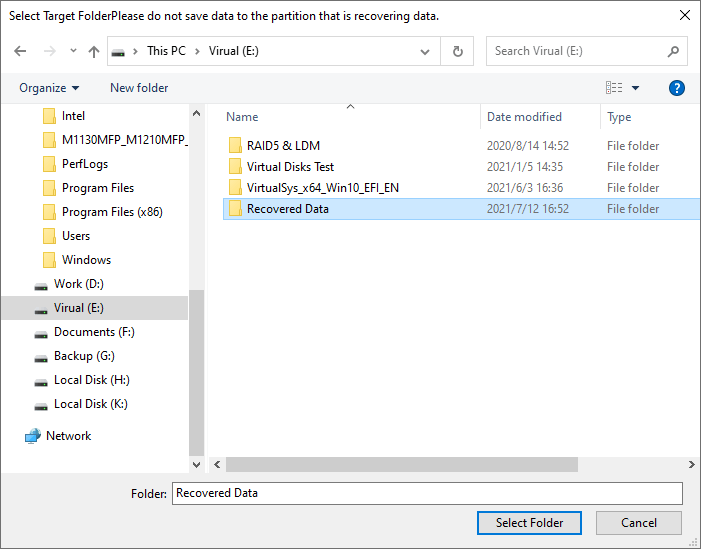 During scanning, Eassos Recovery displays files of the partition and the way it displays files is similar to Windows Explore. On the left part is the directory and on the right the file list. There is a check box on the left of every file and folder and you can check files and folders you want to recover and click the button "Recover". When you click a file, there'll be its preview image on the lower part of the panel. 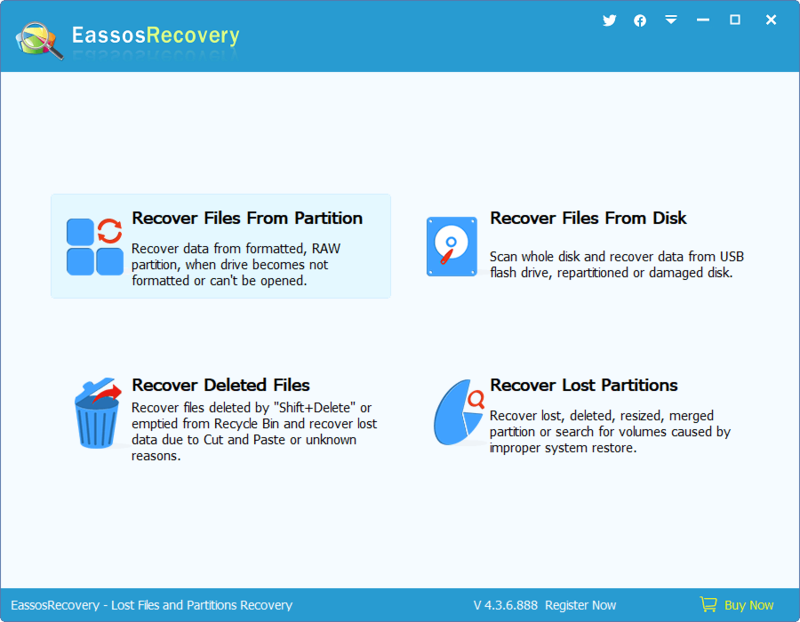 Eassos Recovery now supports previewing pictures, documents, video, audio and text files by which you can judge whether the file is correct or not. You can filter files by setting the name pattern, file attribute, file size and modify time. Set your options and then click the "Filter" button. 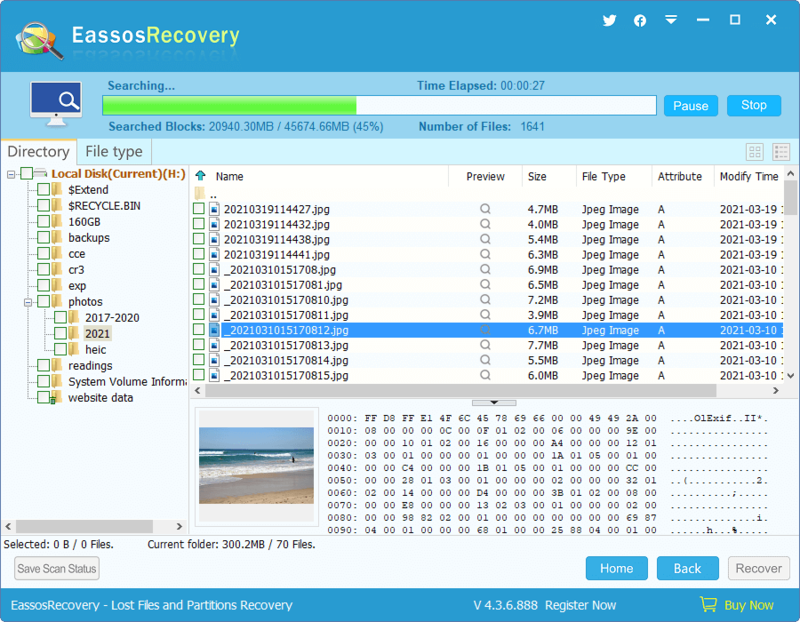 Eassos Recovery provides two ways of copying out the recovered files. One is the context menu. After selecting the files and folders to be copied, right click the mouse button, a context menu will pop up. Then select "Copy to" and set a target folder to start copying. For more details, please refer to "Copy Files by Context Menu". When file copying is finished, the "Stop" button disappears and "Details" button shows up. 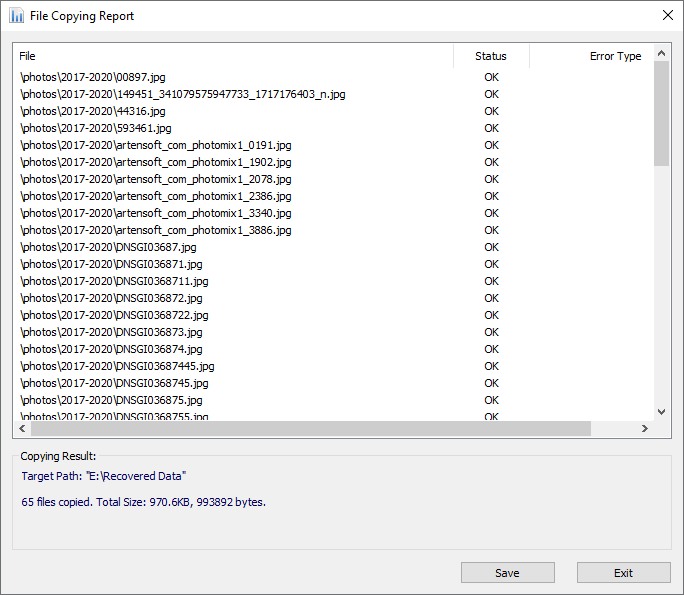 You can click the "Details" button to display a "File Copy Report", and then click "Save" to save the copy report to a text file.